- Fifty years of patent information centers in Russia//World Patent Information -2011-№3. The article contains а brief historical review of developing раtепt infonnation centres in the structure of the State Сommittее оп Iпvеntions апd Discoveries (Rospatent) and their participation in estabIishillg tlle national раtепt information system. Тhe process is divided into three stages resulting from, first, changes in dеmапds шаdе Ьу the new generations of users of information products and services and. 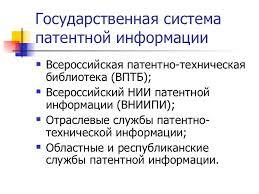 second, renewal of methods, technologies and organizational forms of infonnation support of innovation processes. - 50-летняя эстафета патентно-информационных центров страны//Интеллектуальная собственность/Промышленная собственность-2010-№7 . Краткое изложение развития патентно-информационных центров в структуре Госкоизобретений (Роспатента) и их участия в построении системы патентной информации страны.